Just in time for the July 4th holiday weekend Starbucks is now offering free, unlimited Wi-Fi access at nearly 7,000 company-operated locations across the United States. The policy change came into effect Thursday a little over two years after Starbucks began offering two hours of free Wi-Fi to Starbucks card holders. Now, however, the time limits are gone, and you can enjoy unlimited free Wi-Fi at your local Starbucks any time you like for as long as you like. But before you sink into one of those plush Starbucks chairs with your laptop and a Venti non-fat, no-foam, double shot, extra-hot latte, here are a few tips on what to watch out for and what to look forward to with free Wi-Fi from Starbucks. Starbucks is offering free Wi-Fi at all of its company-operated locations, which means most of the Starbucks locations you visit on a daily basis will have free Wi-Fi. The exceptions will be the stores inside special locations such as airports, Target stores and Barnes & Noble locations. Free Wi-Fi access at these locations may vary. Use the Starbucks Store Locator to find the closest shop near you. Before you get started, make sure you are connected to the right Wi-Fi hotspot. Typically, Starbucks access points are called attwifi--AT&T is the hotspot provider for Starbucks. If you are unsure which access point to use, ask a Starbucks staff member for help or call AT&T technical support at 1-888-888-7520. After you're on the right network, all you have to do is fire up your browser and you'll arrive at a landing page similar to the one you see above. Just check the box that says you agree to Starbucks' Terms and Conditions and Acceptable Use Policy, click 'Connect' and you're off and running. 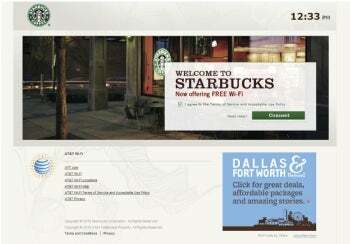 Your first stop once you connect will be Starbucks' free Wi-Fi landing page that includes videos, blogs and other content from Starbucks. 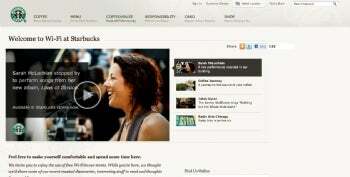 At the time of this writing, for example, the site had a video of a live performance by Sarah McLachlan. Later this year, the landing page will be replaced by the Starbucks Digital Network, which will include a variety of content in cooperation with Yahoo. The company is being pretty vague about exactly what kind of content it will be offering on SDN, but I did find out that through the SDN you will be able to get free, unrestricted access to The Wall Street Journal's Website, WSJ.com. Currently, the Journal hides some of its content behind a paywall. Starbucks says the SDN will include free, unrestricted access to other paid sites and services in addition to WSJ, as well as exclusive content and previews, free downloads, local community news and activities. 1. You are not alone: Keep in mind that every laptop and smartphone user around you is probably on the same Wi-Fi network that you are. Anyone armed with the right software can become a master hacker, leaving you vulnerable to e-mail snoops, Web traffic analysis and general file snooping. 2. VPN: A virtual private network (VPN) is the best way to protect yourself when using a public Wi-Fi access point. A VPN encrypts all your Web traffic and blocks any potential snoopers sitting nearby from horning in on your privacy.